Here Supes gets into his glad-rags and puts in an appearance to warn teens about the dangers of what? To much ABBA in their musical diet? The future prices of comic books? Nope - gate-crashing parties. Ahh the 70's, life was so much simpler then. And now you know...and knowing is half the battle. 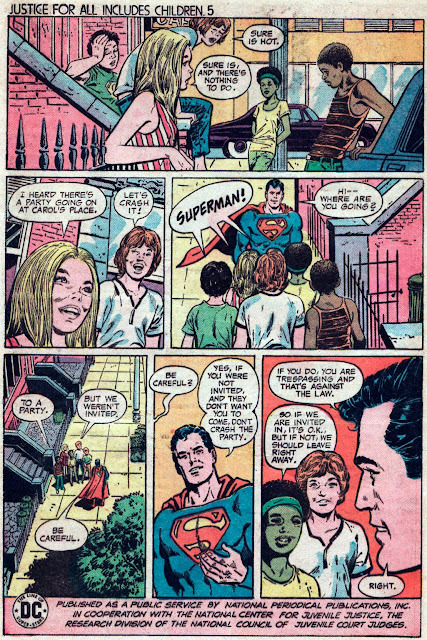 :D We all would have been juvenile delinquents without Superman and G.I. Joe, wouldn't we? We sure would've Random! I wonder if they'll ever bring these kind of messages (on different topics) back? Comics might feel a bit more like comics to oldies like me if they did! I'm pretty sure I would've started smoking if it weren't..for...oh. Wait. That one didn't stick. Well, without that whole Teen Titans story arc I definitely would have done drugs are something similarly stupid. Or stolen fruit pies. Definitely would've stolen fruit pies.